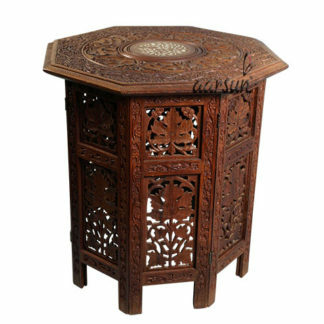 Aarsun Woods provide a Handmade Wooden Side Table / Corner Table with Jaali Work And Brass Inlay. The unit is completely fold-able and sent in Knock Down State which can be easily assembled in 5 minutes without any assistance needed by craftsmen. Designer Products specially made in wood always gives a unique look to your home. The design handcrafted by some artisans looks different and let you have a taste of traditional style. This particular Foldable Wooden Stool is a piece of art finely handcrafted by skilled artisans from Saharanpur, India. 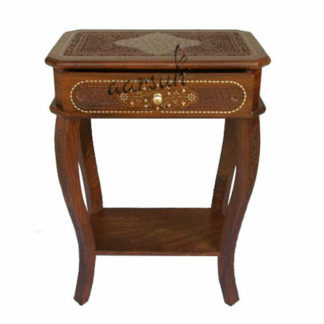 The Wooden Stool is crafted from premium quality Rosewood commonly known as Sissoo or Sheesham which is one of the most widely used hardwood among craftsmen for its ease-of-use. The design contains old vintage carvings such as floral and petal carving along-with a whole tree carved out in the middle at the top with the sides in leaf pattern. The top can be separated and comes in different sizes as per your need. The unit can be folded and packed easily. This benefits someone relocating every other year due to his / her job or business. Also it is a great addition to your home décor. The table when combined with the other handcrafted products looks fantastic. The unit looks equally good when used unpolished. The unit can also be polished in a number of shades. The design and the make can also be changed as you like. Indian Handicrafts are world famous for their handmade products. Saharanpur is famous for wood-crafts and we at Aarsun Woods cherish the same. Rose wood is comes into different shades like from golden brown to deep brown in color and have dark streaks which give them very attractive look and appearance. Rose wood is famous in India for making furniture because it does not twist/bend and split. It is the highly durable and is somehow free from dry-wood termite. Rose wood is of very unique color and gives very fine finish after hand waxing. Some of our Rose wood furniture has wrought iron work which has some iron jaali work and it gives a very elegant look to our Sheesham wood unit. Indian Rosewood is also used in marine and aircraft grade plywood. Indian Rosewood is perfect for making antique furniture for homes and for offices as it gives a very smooth finish to the product. The product is made up of Rose wood gives natural look and delightful touch to your home and office.